A beautiful hike in the Alpi Biellesi, the alps surrounding the town of Biella in the Piedmont region of Italy. This is a perfect area for easy to medium hiking tours, with mountain walks ranging from 1.5 hours to 4/5 hours depending on your fitness level, age and skills. There isn’t any danger or cliffs but you can eventually find some bits of via ferrata in the area if you wish to do so. The closest airport is Turin Caselle which is about 35km away, otherwise Milan Malpensa, which is at about 150Km east. Accomodation can be found either in the town of Biella, Ivrea, oer even by the beautiful Lake Viverone which is at about 15Km. If you need any more information, don’t hesitate to get in touch. People often ask why we ride ..what is it about cycling that at a first look, it seems just a painful long term agony on a bicycle to get nowhere..or something like that. The fact is, it’s hard to explain. At first, it can feel quite daunting, but with patience, it becomes easier and you feel satisfied and proud of what you’ve achieved so far. After your ride, a refreshing shower, a cool drink and a bite to eat and you suddenly feel invigorated and alive, as long as you haven’t done too much of course. Little by little, your body will do all the adjustments needed to make you perform better, stay out for longer rides and be willing to do more of it. In this short clip, I wanted to pass on some of the feelings, the sounds and the landscapes of a cyclist’s journey. It’s a short clip, part of a bigger documentary project, coming out in future episodes. Thank you for passing by, for reading this post and for watching the video. You’re welcome to SUBSCRIBE to my Youtube Channel: Fabulous Sport Outdoors and to follow on all the other social network platforms that I’m registered on. 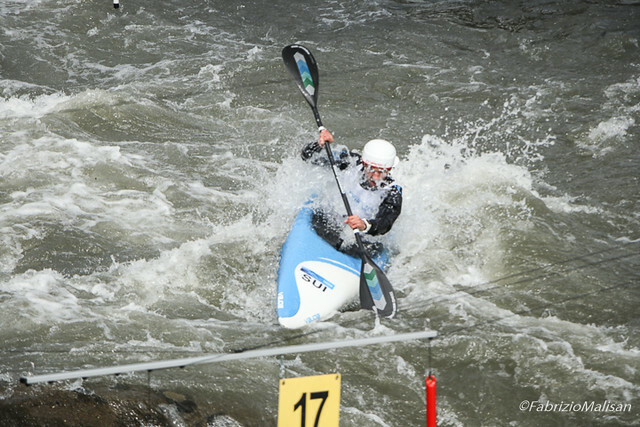 Remember to GET OUT MORE as it’s..
Whitewater canoeing is the sport of paddling a canoe on a moving body of water, typically a whitewater river. Whitewater canoeing can range from simple, carefree gently moving water, to demanding, dangerous whitewater. River rapids are graded like ski runs according to the difficulty, danger or severity of the rapid. Whitewater grades (or classes) range from I or 1 (the easiest) to VI or 6 (the most difficult/dangerous). Grade/Class I can be described as slightly moving water with ripples. Grade/Class VI can be described as severe or almost unrunnable whitewater, such as Niagara Falls. At the request of the Ivrea Canoe and Kayak Club, Hydrostadium accepted an expertise mission in the beginning of 2007. The aim of this expertise was the optimization of the last third of the course with a view to the organization of the World Cup Sprinting in June 2007. Thank you for passing by and for reading this post and remember to GET OUT MORE as it’s..
It’s been a very temperamental winter over the European Alps, lots of snow has fallen, followed by rapid temperature change. Suddenly Spring arrives with it’s beautiful clear skies, white clouds blown by the wind over the mountains, stunning sunrises and sunsets to be photographed. It’s definitely my favourite season to shoot landscapes, but I also love Spring for the awakening of nature. Birds happily singing and busy flying to feed their little ones calling for food from their nest and other animals running around with their new borns. Sunrises and sunsets are pretty good to be captured all year round indeed, but in the Alps or in their proximity, you can still get the snow on the peaks in contrast with the green landscape at a lower altitude. At the same time, you don’t have to freeze yourself as you do in wintertime going up before the sunrise to set your gear for the shoot. For this particular shoot, we were out for one of my photo-walks around the lakes as the sun was about to set creating these beautiful reflections in the water. A travel guide to this beautiful location situated at the foot of Lake Garda in Italy. Valeggio sul Mincio is a village in the Province of Verona in the Italian region Veneto, located about 120 kilometres (75 miles) west of Venice and about 25 kilometres (16 miles) southwest of Verona. It is crossed by the Mincio river. The economy is mostly based on agriculture, with some craftwork and industrial production. Archaeological excavations in the Mincio valley include a Bronze Age settlements, some tombs dating to the Iron Age and some findings associated with the Etruscan civilization. A large Celtic necropolis, found in 1984 still partly buried under the current town, would prove the presence of that people from the 4th century AC and the 1st century DC. The creation of the villages of Valeggio and Borghetto dates to the Lombard rule in northern Italy. The monastery of Santa Maria was founded here, on the Mincio shore, was founded here in the 12th century; later it was a priory of the Knights Templar. The large medieval fortifications which characterize Valeggio (Scaliger castle, the Visconti Bridge and the Serraglio difensive line) were built between the 13th and the 14th centuries. In 1405 Valeggio became part of the Republic of Venice, and subsequently lost its strategic role, becoming an agricultural center and a silkworms trading market. After the fall of the Republic of Venice in 1797, Valeggio was included in the Cisalpine Republic. Later it was part of the Italian Republic (1802-1805) and, after some decades under the Austrian rule, of the newly unified Kingdom of Italy. Visit Valeggio sul Mincio’s official website: “Recognized “City of Art”, Valeggio is the place of complete vacation. Autumn is the season known for it’s fog and mist. However, quite often the thermal wind blows up and down the valleys, clearing up the sky and leaving as to beautiful sunrises and sunsets. I’ll add to this post some more images, as now as I’m writing is just the beginning of that period of the year, by the alps of Italy. GetOutMore as it’s.. FABULOUS OUTDOORS!